Becky Noelle creates a fabulous textured background and adds a partial light green doily on which she stamps the sentiment from the Loads of Blooms stamp set. She creates a very full tulip bouquet (Loads of Blooms) by adding layers of tulips and using dimensional tape. Definitely a lovely card! 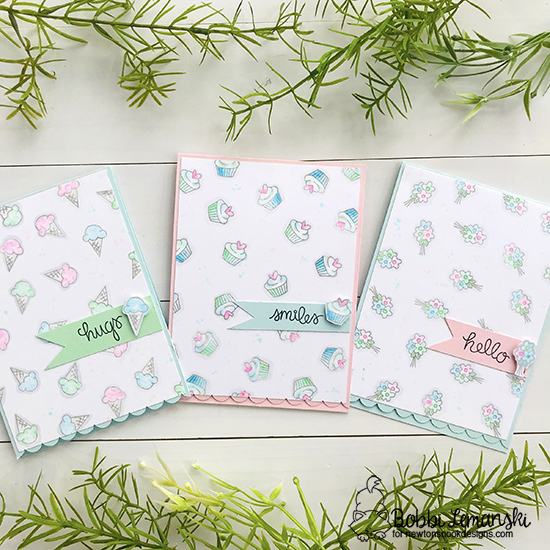 Bobbi Lemanski creates these sweet trio of cards by pulling out the smaller elements from the Sending Hugs stamp set and repeatedly stamping. 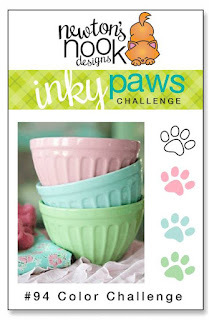 She softly colors them in the pastel challenge colors and adds a small banner with a single word sentiment. Not sure which is cuter--the ice cream cones, the cupcakes, or the bouquet of spring flowers? They are all just precious! Debbie Owens gets us in the mood for camping! She begins by grounding her design with a blue vertically striped paper. She then cuts the sentiment layer using one of the dies from Framework die set. 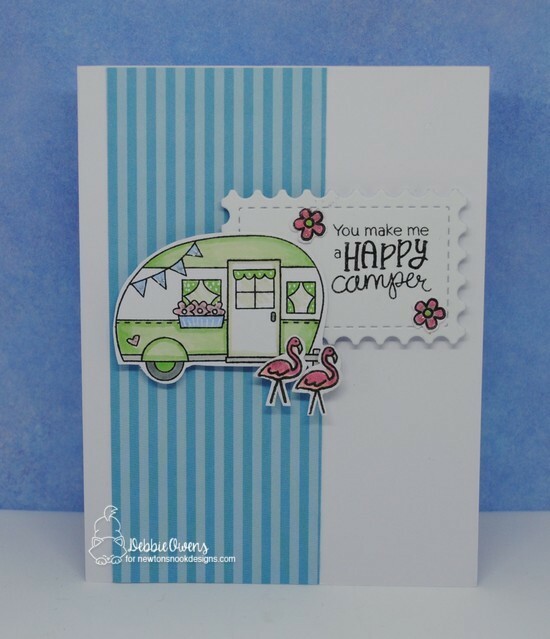 She stamps the camping sentiment from the Cozy Campers stamp set and adds some flowers. She then uses the challenge colors to shade the vintage travel camper. The little pink flamingos are a whimsical touch to finish the scene. Diane Morales creates this delightful card by using the Framework die set for her card base. She uses mint green and sky blue to create her amazing background using the Bokeh stencil set. She incorporates the pink form the challenge colors by coloring the large flower from the Garden Mice stamp and die set in pink. Using the banner from the Frame & Flags die set, she stamps the sentiment. Again, so delightful! 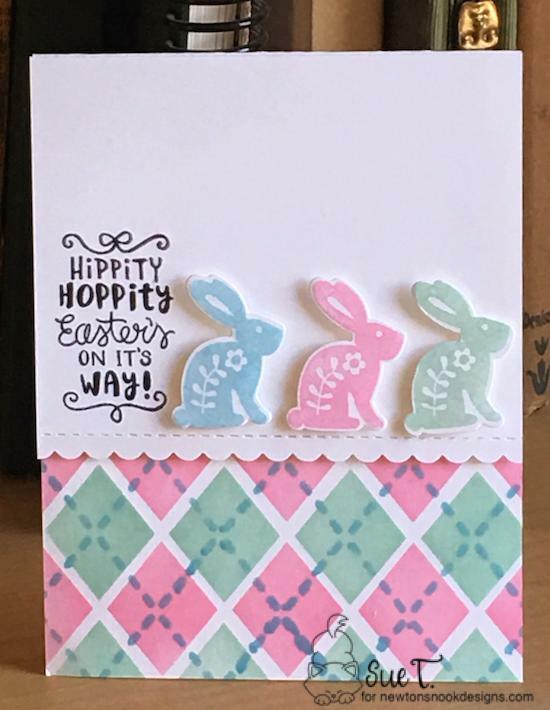 Sue T. creates this striking Easter card by using the challenge colors for her pretty background using the Argyle stencil set. She then stamps a trio of sweet bunnies from the Cottage Garden stamp and die set. She then pairs the bunnies up with the "Hippity Hoppity" sentiment from the Spring Pile Up stamp set. Just love how Sue mixes and matches sets to create such a fun card! I hope these projects have inspired you to play along! Remember, you have until this Friday, April 5, 2018 to enter. There's a prize involved too, so don't delay - view all the entries and see more inspiration on our Inky Paws Challenge here!